A joint PRWeek/OnePoll survey demonstrates the strength of Google's customer perception and reputation. 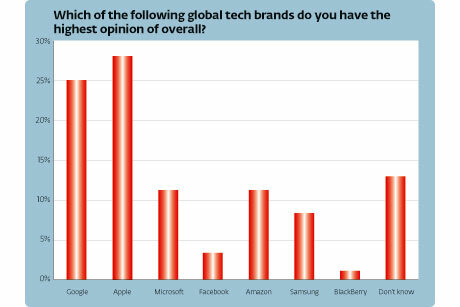 One in four respondents picked Google as the most trusted tech brand, placing it narrowly behind arch rival Apple. At the time of writing, Google was nearing a deal with EU anti-trust authorities regarding its dominant position in the search engine market. 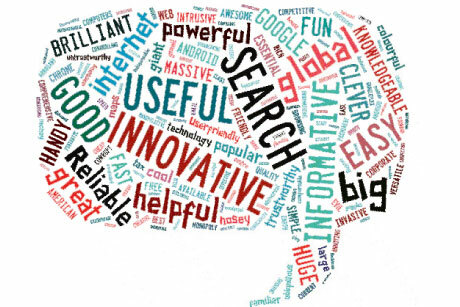 The research illustrated the dominance of Google's search function, with 82 per cent using it above its rivals and 74 per cent using it on at least a daily basis. The public did show some concern about Google's reach, as 31 per cent agreed the firm had become too big and 47 per cent said they were concerned about the level of personal data to which Google had access. However, the vast majority (78 per cent) did not express concern about how Google might use that personal data, while only 24 per cent agreed that Google indulged in anti-competitive practices. In general, younger people had significantly higher trust in the brand, with 50 per cent of 18- to 24-year-olds trusting the brand with regard to data use, compared with 31 per cent of those over 55. Perhaps of most concern to Google is the fact that Apple is seen as vastly more innovative with more user-friendly products. Some 47 per cent of respondents picked Apple as the most innovative tech firm, compared with just 15 per cent for Google. Google is having a tough time at the moment. Not only is it under investigation, but it seems that it is going to lose its director of privacy, a post that was set up in the wake of its WiFi snooping scandal. Looking at the survey results, there are two stats that almost seem to contradict each other. 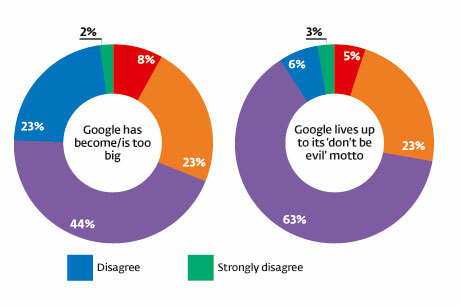 More than a quarter of respondents agreed that Google lives up to its 'don't be evil' motto, yet fewer than ten per cent rated it as the most ethical firm. This is a mismatch that Google needs to address. I suspect that it, along with Apple, is over-reliant on its brand and fan base to carry its reputation and drive its agenda - an agenda that involves selling information about us to advertisers. As the promise of Big Data becomes a reality, technology companies will need to think carefully about how consumers and regulators will react and ensure they understand what they are giving away and the benefits of doing so.